Diseases of the digestive system occupy an important place in clinical medicine. Diseases of the digestive system often affect the most people of working age, causing a high rate of temporary incapacity and disability. Location and general anatomy of the main parts of the digestive tract are shown in Fig. 83. The close anatomical and physiological link between the digestive system makes it impossible to separate treatment of a body with his illness. In diseases of the digestive system are observed changes in motor, secretory and suction functions. Pathological processes of the gastrointestinal tract are in close relationship with each other and are due to disorders of the nervous regulation. As a result of violations of the secretory function of developing gastritis, peptic ulcer, etc., while disorder of motor function – colitis, constipation, etc. The main means of treatment of digestive diseases are diet therapy, medication, massage, movement (exercise therapy, moderate exercise, etc. ), physio-and gidroprotsedury. MPT in this pathology has a tonic effect, debug neurohumoral regulation, stimulates blood and lymph circulation in the abdominal organs, strengthens the abdominal muscles, helps to normalize evacuation and motor functions of the intestine, etc. The result of the impact of exercise depends on the type, dosage, rhythm and tempo run on the stage of their application, the duration of the course, as well as combine them with diet and other remedies. Studies have shown that moderate physical training normalizes secretory and evacuation functions of the stomach, and intense physical training – on the contrary, repression. Application of special exercises and segmental-reflex massage helps to normalize the disturbed functions. So, the exercises for the muscles of the abdominal wall and pelvic floor well help in chronic colitis, cholecystitis, dyskinesia and others, and breathing exercises have a “massaging” effect on internal organs, improving circulation and lymph flow in the abdominal cavity. However, the exercises for abdominals, as studies have shown dramatically increased abdominal pressure, so they are contraindicated in patients with acute exacerbation of gastric ulcers and duodenal ulcers, and spastic colitis. Such patients are useful breathing exercises, relaxation exercises while lying on your back with legs bent at the knee and hip joints, or in the knee-elbow position. Massage facilitates bile flow (VI Dubrovsky, 1973, 1985) by increasing blood and lymph circulation in liver and abdominal organs. Physical exercises help to normalize the disturbed functions with dyskinesia of the gastrointestinal tract and biliary tract. Thus, exercise therapy and massage have a positive effect on the abdominal organs, stimulate the regulatory mechanisms of the digestive system. Gastritis – inflammation of the gastric mucosa, can be acute or chronic. Acute gastritis is often a consequence of receiving irritate the substances most often alcohol, use of substandard or unusual foods, some medications, Foodborne diseases, acute poisoning. When population screening of industrially developed countries approximately 50% of people, many of whom complained about the changes in the stomach to detect signs of gastritis (V.Kh.Vasilenko, AP crest; Villako K. et al., Etc. ). It was also established that oxygen starvation of the organism, as an important pathogenetic factor, has a great influence on the course and outcome of many internal diseases. Known and another: cancer of the gastric mucosa are very sensitive to oxygen deficiency. Prolonged hypoxia leads to atrophy of the gastric mucosa with the development of enzymatic and secretory insufficiency. Hypoxia of the gastric mucosa contributes krovopereraspredelenie when performing strenuous exercise. The main portion of the blood is sent to the vital organs (brain, heart, liver and the muscles), while the exchange flow in the abdominal organs is reduced (MM Mirrakhimov, 1975). Thus, hypoxia is the cause of chronic atrophic gastritis (EK Rychkov, TN Sauchikova, 1973, etc.). Chronic gastritis – vospalitelenoe change gastric mucosal endogenous or exogenous nature. Characteristic signs of chronic gastritis are: bad taste in mouth, acid regurgitation, nausea, especially in the morning, the severity of epigastric pain, bloating and pain, resembling ulcerative, gastritis with secretory insufficiency may be diarrhea. A major role in causing chronic gastritis are alcohol abuse, smoking, drugs, malnutrition (chronic lack of food of animal protein, vitamins B, A, C, E) and irregular (violation of diet) food intake. Often the cause of chronic gastritis is the fulfillment of intense physical activity, including in sports. Gastritis classified (including gastric secretory function) in gastritis with secretory insufficiency, gastritis with increased secretion and acidity, gastritis with normal secretion. In athletes is common gastritis with increased secretion and acidity, which often turns into ulcer. The most commonly chronic gastritis with high acidity found in men. Symptoms: heartburn, acid regurgitation, burning sensation, pressure or heaviness in the epigastric region. On palpation the abdomen indicated moderate pain, and sometimes marked neurasthenic syndrome (increased irritability, poor sleep, fatigue, etc.). Used for the treatment of diet therapy, medication, vitamins and other means. Recommended gymnastics, hiking, skiing, swimming, cycling. With spa treatment: swimming, walking and jogging along the seashore, playing on the beach, diet, oxygen cocktails, gymnastics, etc. MH includes general developing and breathing exercises, relaxation exercises. If pain symptoms shown cryomassage abdominal wall. 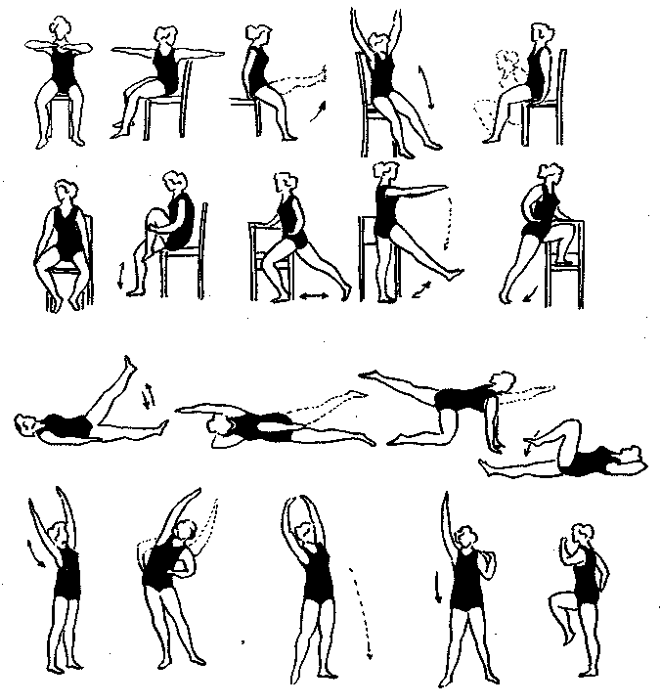 However, the exercises for the abdominals are contraindicated. Useful for walking, douche, MH lying (breathing exercises, exercises for the distal lower extremities). The problem of massage: to analgesic action; normalize secretory and motor functions of the stomach to increase blood and lymph circulation, remove the existing usually venous stasis, promote bowel function. Massage technique. Massage the abdomen is performed with a maximum relaxation of muscles of the abdominal wall. Apply planar stroking, kneading the muscles of the abdominal wall, oblique abdominal muscles, as well as vibration. Then, in the course of the colon (from the ascending part of it) is carried out stroking her fingertips right hand. Receptions strokes repeat 4-6 times, and then make a few superficial circular strokes to give the abdominal wall to rest, and then spend effleurage fingertips along the intestine and its jarring to influence his wall. Complete massage of the abdominal wall in-plane stroking and diaphragmatic breathing. Duration of the massage for 10-15 minutes. Factors contributing to the emergence of peptic ulcer disease are different disorders of the nervous system, some patients may have a value of inherited predisposition, and neuro-psychic overstrain of the CNS and its peripheral regions, errors in diet, alcohol, spicy foods, chronic disease of the gastrointestinal gastrointestinal tract and other factors. Gastric ulcer and duodenal ulcer in most patients preceded by complaints of heartburn and acid belching, nausea and other symptoms. But the main symptom of a peptic ulcer is pain, which is punctuated in the spring and autumn. There are also easy excitability, irritability, sleep disturbance. Comprehensive rehabilitation includes: massage, MH, diet therapy, physiotherapy and hydrotherapy, drinking mineral water and other therapeutic agents. MH (Fig. 84) is applied to the period of remission, the absence of dyspeptic and pain phenomena, with normal parameters ESR, hemoglobin and white blood cells, and in the absence of occult blood in feces. When a pain in the epigastric region shows cryomassage, excluding the methods that cause muscle tension abdominals. 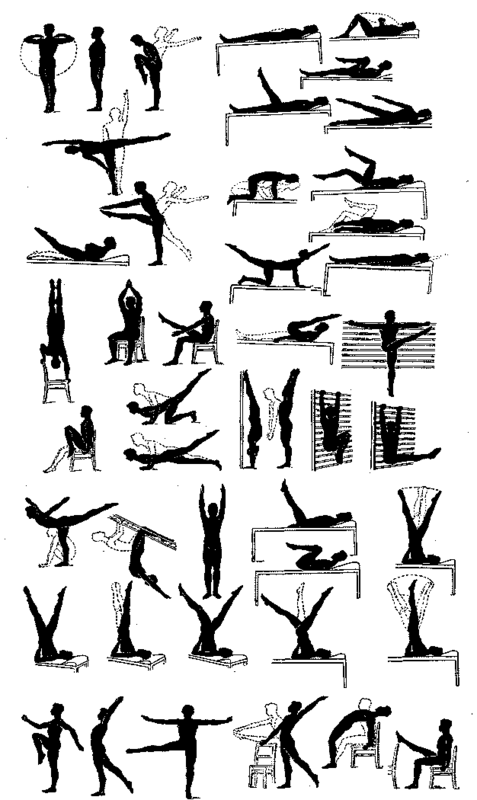 Exercises are performed lying down, at a slow pace and monotonous rhythm, accompanied by music. Duration 8-10 minutes, then taking a contrast shower. Recommended spa treatment, during which time: walking, swimming, games, winter – skiing, skating, etc., diet therapy, drinking mineral water, vitamins, UFO, douche. In the phase of complete remission MH performed standing, sitting and lying down. Include exercises with gymnastic stick, balls, dumbbells, exercises at the gym (or block devices), sauna (bath) and a long walk in the quiet pace. The problem of massage: the normalization of mental and emotional state, sleep, pain relief, acceleration of the oxidation-exchange processes and the regeneration of the mucous membrane. Massage technique. Massage neck area, back (segmental effects on cervical-thoracic spine) and the abdominal wall. Massage of the abdominal wall is held in remission. Hack, effleurage and eliminate vibration. Duration of the massage for 10-15 minutes. Course 15 – 20 procedures. In the year of 3-4 courses. Massage preferably held in a darkened room, accompanied by color music, then – oxygen cocktail reception (cocktail should include a variety of teas from herbs). Biliary dyskinesia characterized by a disorder of motor function of individual parts of the biliary system, including the sphincter of Oddi. It is promoted by various autonomic nerve disorders.Dyskinesia of the biliary tract is an initial step in the pathogenesis of other diseases of biliary tract, contributing to the formation of stones in the gallbladder and the development of infection. Often combined with other functional disorders – dyskinesia of the duodenum, the changes of the function of the stomach, intestines, pancreas. In the spastic, or hyperkinetic, gallbladder marked short-term pain in the right upper quadrant and epigastric region. For atopic or hypokinetic, gall bladder characterized by long dull pain after eating, worse long-term position of the patient sitting. The evacuation of bile is slowed down. Dyskinesias are quite common in athletes (cyclists, skiers, runners-stayers, etc.). For the hyperkinetic form of dyskinesia is characterized by paroxysmal pain (biliary colic), which occur after physical activity (acceleration) and are often accompanied by nausea, vomiting, a violation of the chair, as well as irritability, headache, deterioration of general condition. Hypokinetic dyskinesia manifested intermittent pain and a feeling of fullness in the right upper quadrant, sometimes dyspepsia and deterioration of general condition. Comprehensive treatment includes massage, MH, diet, drinking mineral water, physio-and hydrotherapy, drug therapy, herbal medicine and other medical facilities. MH consists of General developing and breathing exercises, is of great importance source of choice. The best conditions for the circulation in the liver, bile formation and release are in the prone position. To enhance the effect of the diaphragm can be used breathing exercises while lying on his right side, as this tour of the right dome increases. In addition, MH and hold-ups on his knees, and Bozeman, which helps to relax the abdominal and unloading of the spine, allow you to perform exercises with the lifting and aligning the feet with no abrupt changes in intraabdominal pressure. When the form of hypokinetic dyskinesia MH carried on his back, on the left and right side, the emphasis on his knees, kneeling with an emphasis hands on the floor, sitting and standing. Perform General developing and breathing exercises with gradually increasing amplitude and rate of movement. The complex includes PH and exercises for the abdominals, walking, “belly breathing” helps to reduce (or eliminate) pain. Duration of sessions 20-30 min. During the period of complete remission recommended games, skiing, rowing, skating, cycling, swimming, etc. When the hyperkinetic form of dyskinesia MH performed supine, right and left side. Include General developing, breathing and relaxation exercises. Not recommended exercises for abdominal exercises with projectiles (dumbbells, padded balls), as well as tension and breath holding. The pace of the exercises slow and average. Duration of employment for 15-20 minutes. During the period of full remission – dosed walking, walking skiing, swimming, occupational therapy, ice skating, etc. The problem of massage: the normalization of mental and emotional status and function of biliary tract, analgesic action, the elimination of stagnation in the gallbladder. Massage technique. Initially held massage neck and back area (segmental zones VIII-X chest and I-II of the lumbar vertebrae, especially the right) with segmental techniques. Then, in the supine position massaged my stomach and obliques. Complete the process by squeezing the lower segments of the lungs (exhalation the patient), Repeat 3-5 times, then ask the patient “belly breathe” for 1-2 minutes (legs while bent at the knee and hip joints). Excluded methods: hack, deep effleurage and kneading (especially in the right hypochondrium). Duration of treatment 8.12 min.Course of 10-15 procedures. Chronic cholecystitis – a chronic inflammation of the gallbladder. May occur after acute cholecystitis, but more often develops gradually and independently. Occurrence of chronic cholecystitis by a variety of bacterial flora. Meet cholecystitis toxic and allergic nature. Important predisposing factor in the development of cholecystitis – stagnation of bile in the gallbladder, which can cause gallstones, compression and excesses biliary, dyskinesia of the gallbladder and bile ducts, arising under the influence of various emotional stress, endocrine and autonomic disorders and other stagnation of bile in the gall bladder also contribute occasional meals, great exercise, hypothermia, and others are typical dull, aching pain in the right hypochondrium. Pain irradiruyut upward toward the right shoulder, neck and right shoulder. Frequent dyspeptic symptoms: the bitterness and metallic taste in the mouth, nausea, bloating, impaired defecation. There are also irritability and insomnia. On palpation the abdomen is determined by pain in the projection of the gall bladder to the anterior abdominal wall and slight muscular resistance to the abdominal wall. The liver may be increased slightly, with plotnovatym and painful on palpation edge (with the development of chronic hepatitis, cholangitis). Along with the provision of treatment (diet, medication, etc.) 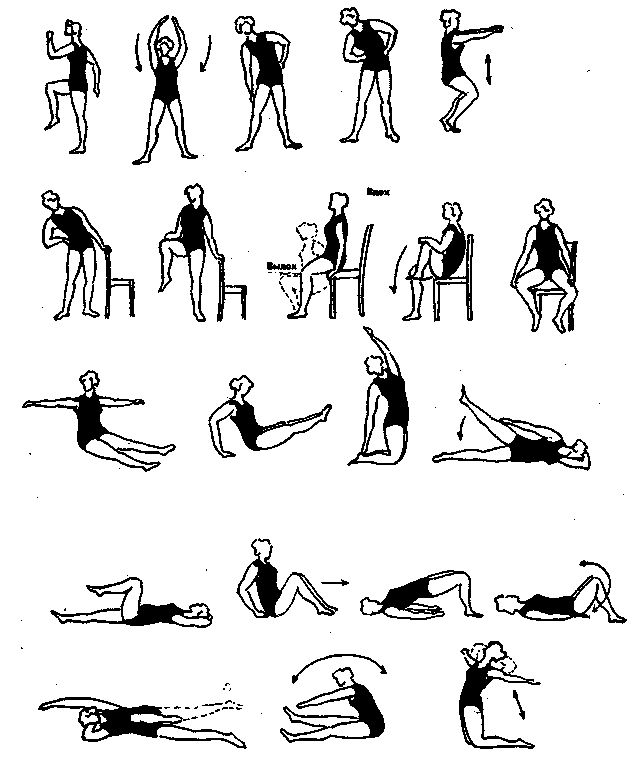 designate a massage, MH (Fig. 85), swimming, skiing, etc. Indications for Massage: nekalkuleznye gallbladder disease, coupled with a decrease in motor activity and tone of the gall bladder. Massages are performed in the remission period (outside the acute stage). The problem of massage: improving biliary function, bile outflow; removal of spasm, raising the tone of the gallbladder and sphincter. Massage technique. Exercise influence on the reflex zones on the left spine and a zone of Boas, projected on the domain end of XI-XII ribs on the right and organospecific for gall bladder. In this projection reveals area of hyperesthesia (increased tactile sensitivity) due to abnormal trophic vistsero kutannogo reflex. Apply stroking, rubbing and kneading. When exposed to reflexogenic zone spinal segmental massage techniques are used (“Saw,” “boring”, “moving the”, etc.) combined with stroking, rubbing. Duration of the massage for 10-15 minutes. After a massage greatly increases the secretory and excretory function of this important organ as the liver (p <0,05). Constipation can be functional or organic origin. The functional disorders of motor function of the intestine are spastic and atonic state. The pathogenesis of constipation is associated with reflex influence from the central nervous system or changes in intramural innervation apparatus of the intestine, decreasing production and increasing holinerergicheskih andrenergicheskih substances, violations of electrolyte-mineral metabolism that causes the development of dyskinesias bowel and constipation. Revealed spastic and atonic colitis. Showing massage, LH (Fig. 86), gidrokinezoterapiya, swimming, boating, etc. Goal of massage: in spastic colitis – to achieve antispasticheskoe action normalize reflex connections, circulatory and intestinal peristalsis, with atonic colitis – stimulation of the parasympathetic nervous system, increasing blood and lymph circulation in the intestine, the normalization of intestinal peristalsis. Massage technique. To stimulate the motor function of the colon in its lethargy conduct massage the lumbar region, sacrum, buttocks, abdomen, groin, thigh muscles. Used techniques: effleurage, kneading, and more – vibration. In spastic colitis techniques of vibration are eliminated. Duration of the massage for 5-10 min. A course of 15-20 procedures. In the year of 2-3 courses. In identifying colitis in women shows a pelvic massage. Duration of 3-5 minutes. 5-8 procedures per course (held in a day or two). Ventroptosia – prolapse of the stomach. Among the reasons for the disease is isolated, such as a weakening of abdominal muscles, a significant weight loss, asthenic conditions, lack of exercise, etc. For patients with ptosis of the stomach is characterized by complaints of heaviness, pressure, and sensation of fullness in the epigastrium after meals, belching air, bulging lower abdomen, bloating, etc. The complex treatment includes massage, MH, swimming, physiotherapy, diet therapy. MH (Fig. 87) runs on my back (with raised pelvis), on all fours, in Bozeman’s position.General developing include exercises, breathing (“diaphragmatic” breathing) exercises with a rubber shock absorber, dumbbells, as shown gidrokinezoterapiya (diving board, the fins, with a spatula, pool games), cryomassage abdomen. In what used vibro back, buttocks, lower limbs lasting 10-15 minutes. Course of 15-20 procedures.